This is one of my favorite pictures of Osar. 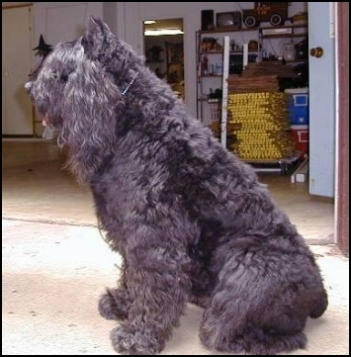 Oscar had a great disposition; he was my gentle giant. Many people who came to my house to visit my Bouviers would invariably end up with their arms around him and ask me if they could take him home with them. He was 27" to his shoulders, heavy boned wide chest and gorgeous big head. 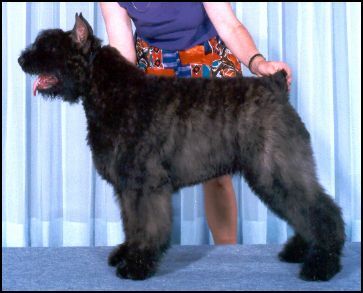 He finished quickly winning all four days at the 1996 Kentuckiana Cluster and his very next show at the Chicago International shows (5 shows in a row!!). 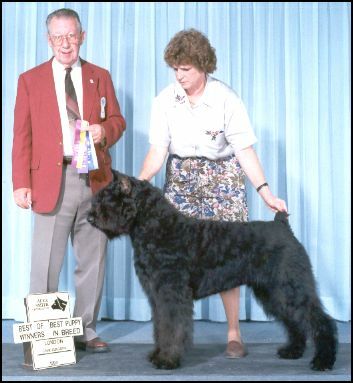 He won Group 2 in Canada taking Breed out of classes over Special. Oscar lived to be 12 years old and is greatly missed. We miss his big slobbery kisses and his howl when he was left outside longer than he wanted to be. He didn't like to be left outside by himself so he would howl. His howl sounded like a siren starting with a low pitch, slowly rising and ending with a high osculating up and down sound. Oh we miss this boy!! Copyright © 2019, Cam Kennels All rights reserved. No part of this site may be reproduced without written permission.